Did you know that Super Bowl Sunday is the second largest day of food consumption in the United States after Thanksgiving? Rather than a sit-down dinner, on Super Bowl Sunday food is usually served buffet style. And what’s the number one food of choice, pizza, of course! Statistically speaking, delivery businesses double their food sales on Super Bowl Sunday. Pizza comprises roughly sixty percent of the takeout orders on Super Bowl Sunday! So what’s the perfect pizza for the Super Bowl? Dough Boys (626 S. Racine Ave., Chicago, IL, 60174; 312-226-9300) is offering a twist on their popular 3-foot Metro Pizza, cleverly spelling out XLVI in meatballs and giardiniera on top. 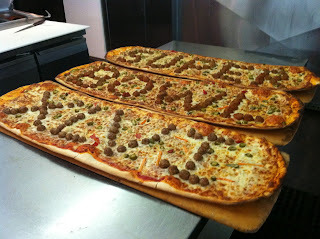 If the perfect Super Bowl Sunday pizza is what you seek, Dough Boys has the answer. It’s a legendary pizza for a legendary game. The Metro Pizza is $39.95 and available for carry-out and delivery. Make sure to place your order early! Pizzas this incredible don't stick around forever.